Where’s your special lion? Find it! Stroke a fuzzy nose. Rub a shaggy mane. Tug a scratchy tail. Stroke all the brave lions as they prowl around the jungle in a touch-and-feel feast of lion fun! 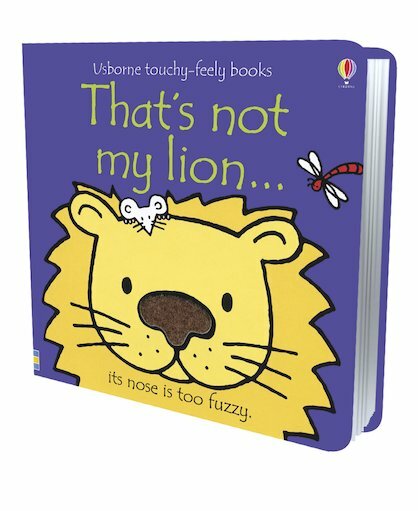 This lovely board book from the popular Usborne Touchy-Feely series encourages tots to try out simple words and see how their meanings match real objects in the world. Full of textured patches and bold illustrations in delicious colours, it provides hours of fun and is perfect for developing hand-eye coordination. These touchy feely books are excellent for babies. My son loves this book and goes straight for the touchy feely bits. They are great for babies to learn about different textures.